It's easy to triple your capacity when you have essentially none to start with. The question is, how many megawatt-hours are you going to build? The Dinorwig Power Station in the UK holds 9.1 Gigawatt-hours, being one of the largest pumped storage sites in the world, but in context of the whole UK grid it has a capacity of about 15 minutes. In the Australian grid that would be 21 minutes (25.5 GW year-round average). For pumped storage of renewables to count as baseload, you can start by averaging over the solar energy production of a single day. Suppose 6 hours of peak production, followed by running 18 hours of reserves as a rough simplification - that would be pretty much two Dinorwigs for every 1 GW of "baseload" you intend to have, and you're pumping a whole lake of water every day. Wind power is trickier to turn into baseload, because you can have a full week of calm and reduced output, and then a week of high winds - it only starts to average out properly on a timescale of weeks to a month. Though you still get a variation of 30-50% between summer and winter months, and year-to-year variations, so you also have to think about seasonal storage schemes, and that runs into the Terawatt-hours which simply isn't feasible with pumped storage, or just about any storage - except that one crazy German concept of coring out a kilometer wide plug of bedrock and using it as a hydraulic piston. Good luck with the earthquakes. Meanwhile, turning renewable energy into gas (methane), and pumping it into pipes and gas bells easily stores hundreds of Terawatt-hours of energy, and runs your cars and kitchen appliances just fine. Wind/Solar plus Pumped Storage don't work even in small-scale, worse yet in large-scale. 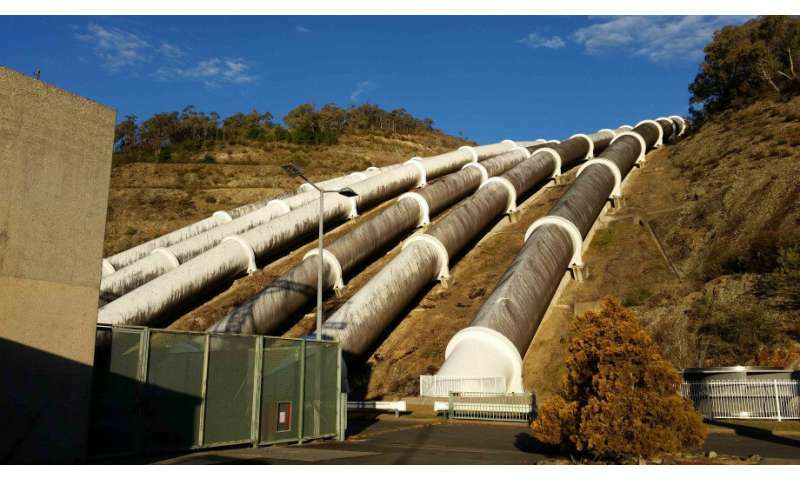 "The absolute best form of storage is pumped hydro; but when it is used with wind turbines and solarPV the energy returned on energy invested drops below the breakeven point." "Storage systems are incredibly expensive in the case of batteries—and geographically limited in the case of pumped hydroelectric"
"A mix of hydro and nuclear works. Hydro happens to fall into the "renewables" category. And is alternately included and excluded, in the data when convenient by RE fans."